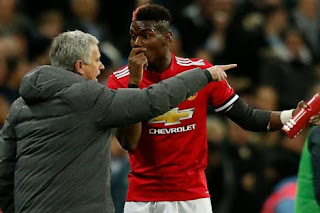 Manchester United gaffer, Jose Mourinho has insisted that he is playing Paul Pogba in his 'perfect position.' The visibly angered Mourinho insists that it is “bulls**t” to suggest that Pogba is not playing in a more suitable role. Though the Portuguese gaffer however admitted that his £89m midfielder’s form has dipped. However he insists pundits’ analysis of how he uses Pogba is wrong because the French star plays in the position he likes best. Mourinho rapped: “It is quite ridiculous to speak about his position. We have the biggest pundit industry here, there are hundreds of them with great backgrounds and knowledge in football.